The Reports page allows for a user to request event-related reports to view or download. 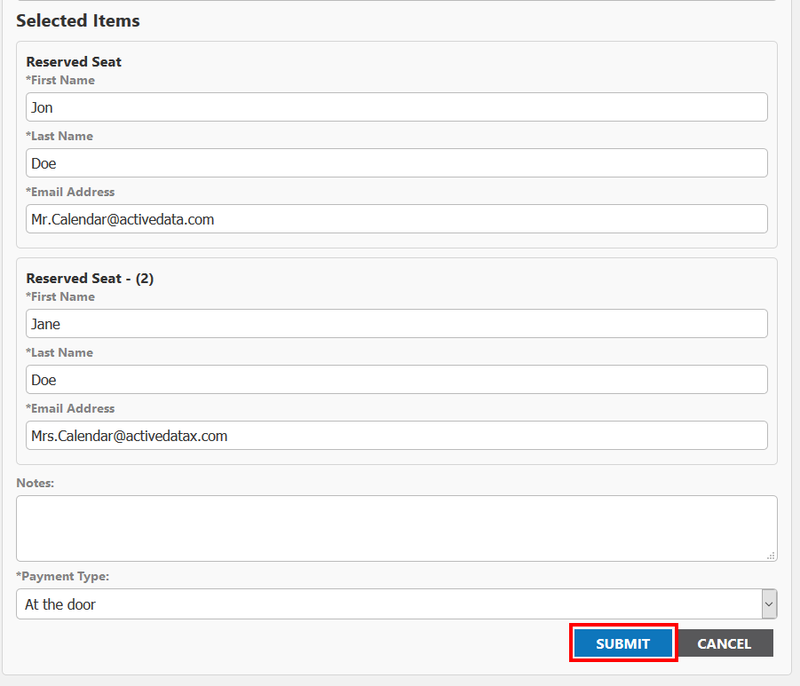 In this area, the calendar allows you to access the Dashboard or Registration Report created for each event. Please note, you can view reports for a single event per request. You will need to search the reports page to access the listing of events. By default, the reports page will not display a listing of events, you must click the "Search" link to generate the list of events to access reporting. Once you have clicked the "Search" link all events matching your filter will be displayed in a table directly below the keyword, start date, and end date filters. This table is organized in to the following columns: Name, Date/Time/ and the reporting links. 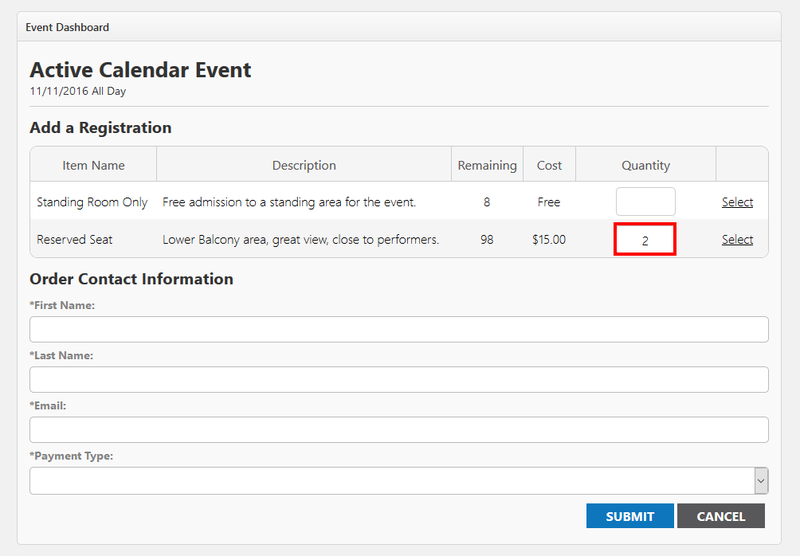 Two options (displayed as links to the right of each event) will displayed for each event, "Dashboard" & "Registration". 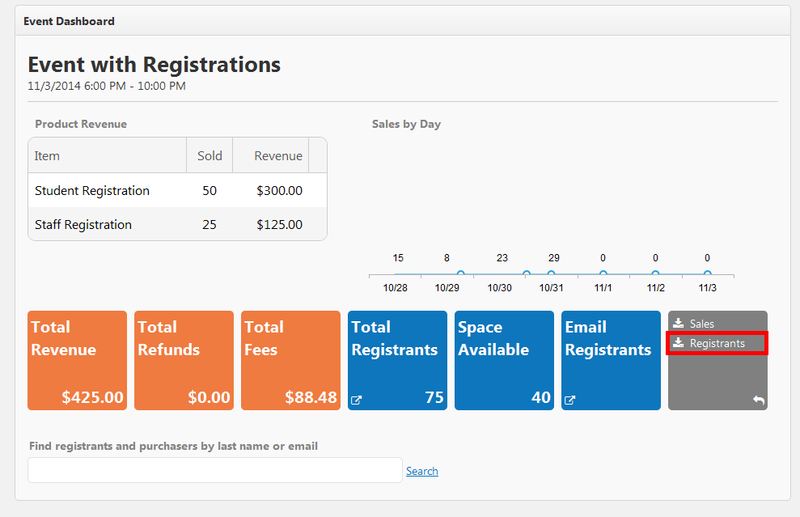 Dashboard: Selecting Dashboard will navigate to reporting page that contains all registration and sales information for that event. 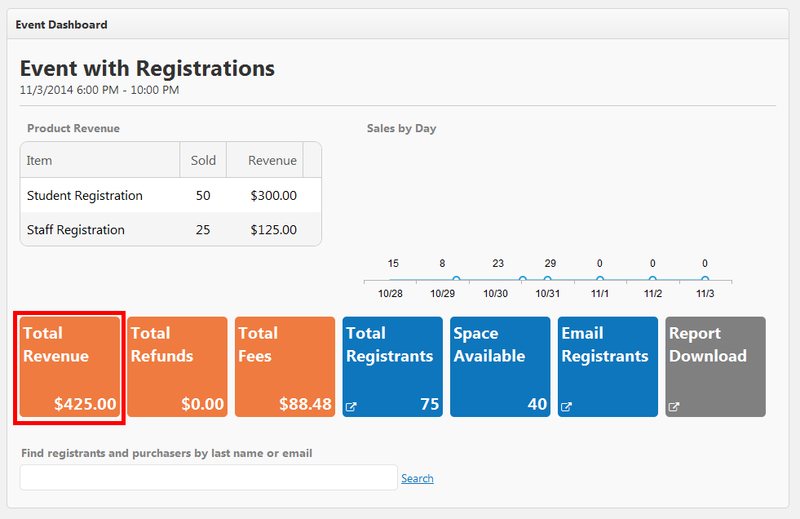 The Dashboard will include details for: items sold, total revenue, total registrants, spaces available. The Dashboard also allows user to: search for, view, download, and modify registrants. Registration: Selecting Registration will navigate you to the registrant page (registrant report). Location Conflict Report: Available to premium license clients only, generate a report of double booked locations. 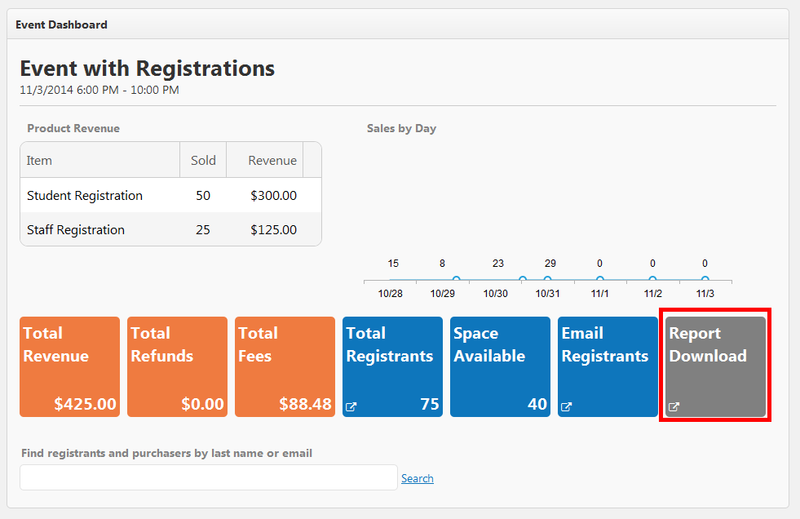 The Dashboard Page contains all registration and sales information for a single event. The Dashboard will include details for: items sold, total revenue, total registrants, and spaces available. 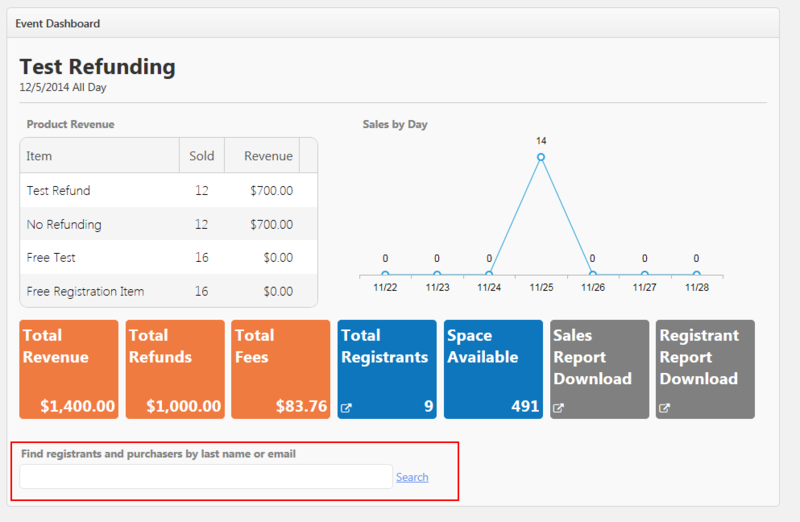 The Dashboard also allows user to: search for, view, download, modify, and email registrants. This area contains a list of all registration and sales items purchased for that event. 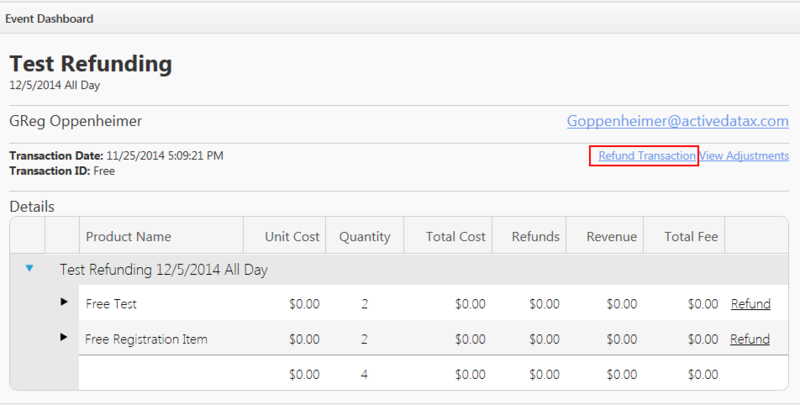 The list contains a summary of the item name, quantity sold, and total revenue for each item. Free items are included in this list as well. Please note: Items that have been added to events, but do not have any registrations or purchases are not listed here. This area contains a graph of the number of items purchased over the past 7 days, including the current day. The numbers shown in the graph include the total number of items sold across all items added to the event. 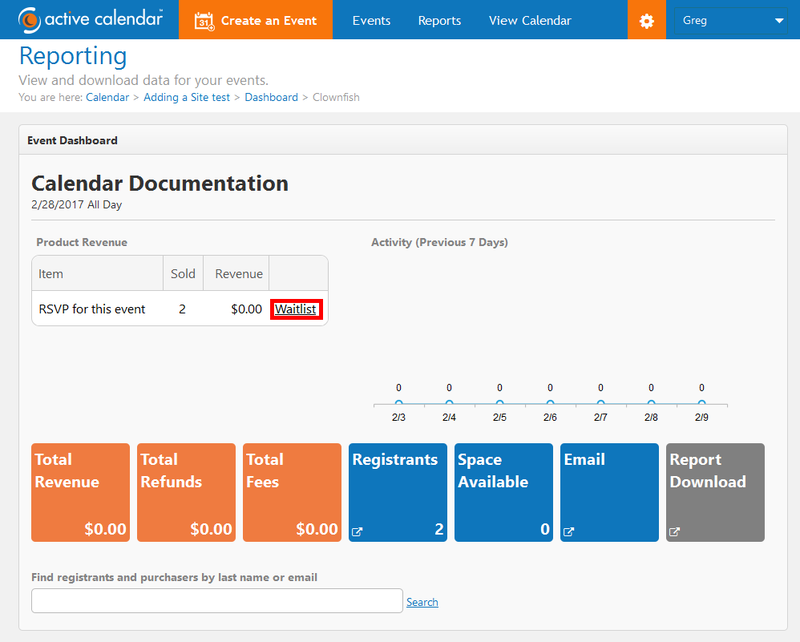 This area contains different tiles to quickly view a summary of event activity, including revenue (orange tiles), registration information and email actions (blue tiles), and reporting (grey tiles). This tile contains the total amount of funds collected for the event. Total Revenue does not include PayPal fees or refunds. However, the Total Revenue tile will include fees paid to Active Data. The Total Revenue number will be the same as the total sum of the revenue column of the Product Revenue table. This tile contains the total amount of money that was refunded to purchasers. The Total Fees tile contains the total amount of funds charged by and paid to Active Data. These funds are automatically transferred to Active Data and do not require any action by the calendar administrator to release payments. This tile contains the total number of registration items purchased for an event. This number includes the total number of registration items purchased for an event. In order for an item to included in this count, it must be added to an event with an item type of "Registrant". This count will include all registration items for an event. If an event has two registration items, adult and child registration, the sum of adult and child registrations will be shown. Please Note: This number does not include the number of saleable items sold, such as t-shirts or hats. This tile contains the remaining number of registration items available for an event. 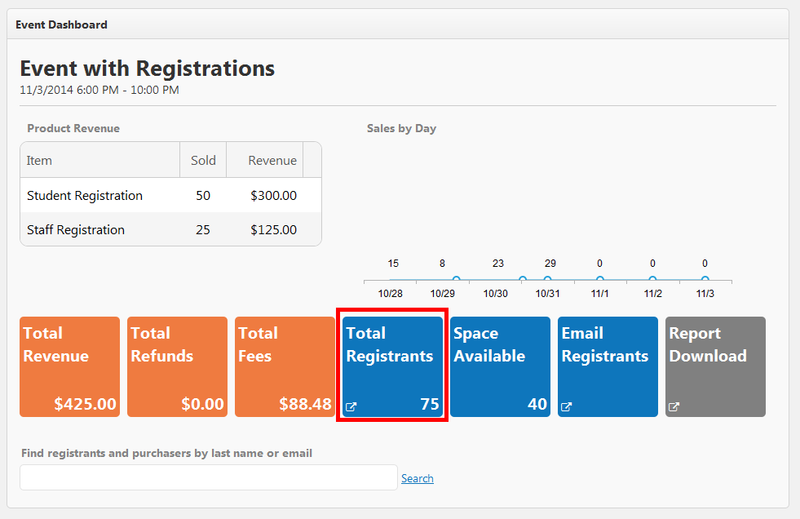 This number is calculated as: (Total Available Registration Quantity - Sold Registration Quantity). Please Note: This number will not include the remaining number of saleable items. Registrants: All persons who have registered for the event. Purchasers: All persons who have purchased an item, or provided their information on the confirmation page during checkout. Custom List of Email Addresses: Selecting this option will allow you to provide a list of persons (email address) to receive the email. Use the check boxes to select who will receive the email. You can select a single option or multiple options. When creating an email, you can specify an email subject and email content (body). Email Subject: Specify the text to appear in the subject line of the message to be sent. Email Body: Specify the text to appear in the email to the registrant, the message can be plain text or html, and you can use tokens (see below) to automatically populate content into the email message. Event Name: Displayed as ##EVENTNAME## this token will automatically add the name of the event to the email when viewed by the recipient. Start Date & Time: Displayed as ##STARTDATETIME## this token will automatically add the Start Date and Time of the event in the following format MM/DD/YYYY HH:MM AM/PM. First Name: Displayed as ##FIRSTNAME## this token will automatically add the first name of the purchaser or registrant to the email when viewed by the recipient. Please note: This token will not populate for email addresses added using the "Custom List" option. If this token is present and the recipient was added to the email using the "Custom List" option, a blank space will be added in the place of the token when viewed by the recipient. Last Name: Displayed as ##LASTNAME## this token will automatically add the last name of the purchaser or registrant to the email when viewed by the recipient. Please note: This token will not populate for email addresses added using the "Custom List" option. If this token is present and the recipient was added to the email using the "Custom List" option, a blank space will be added in the place of the token when viewed by the recipient. Use the report Download tile to access the following two reports. Use this tile to generate the sales report for this event. Clicking the "Sales Report Download" tile will download an Excel Spreadsheet (.CSV File) This report will contain the following information. Event Name: The Name of the event. Product Name: The name assigned to the registration or product that has been purchased or registered for. Unit Cost: The cost of the Product or Registration that has been purchased or registered for. Unit Fee: The fee, paid by the consumer, collected by Active Data for the transaction. Quantity: The total number of units (products or registrations) for a single transaction. Quantity Cancelled: The total number of unites (products or registrations) that have been cancelled for a single transaction. Total Cost: The total dollar amount (excluding fees) paid by the consumer, for the units purchased. Total Fee: The total dollar amount of fees collected by Active Data for the units purchased. Refunded: The total dollar amount of monies collected that have been refunded for a single transaction. Revenue: The total dollar amount (including Active Data fees) paid by the consumer, for the units purchased. Registration Source:Used to group the registration into one of three types. A self registration indicates that the registration occurred on the front end of the calendar by the user registering. Admin indicates that the registration occurred via the administrative area of the application, and was added by a person other than the registrant. API indicates that the registration was added programmatically by an external application leveraging the Registrant API. Payment Type: Indicates how funds were collected for the associated registration. "Online" indicates that the payment was processed at the point of sale, during the registration. The following payment types apply only to administrative added registrations: "At the door", "Over the phone", and "Complimentary". At the door payments are due the day of the event, at the event venue. Over the phone indicates that payment was processed via a 3rd party payment process, while the administrator was processing the registration. Complimentary indicates that the cost of the registration was waived and no payment was collected or due. Event Id: The system generate unique Identity (GUID) for the event. Detail Id: The system generate unique Identity (GUID) for the transaction. Please note this ID is provided to PayPal for reporting purposes. Order ID:The system generated unqiue ID for the order, used to show which registrations were processed together, i.e. in the same shoppping cart or order. Use this tile to generate the registrant report for this event. Clicking the "Registrant Report Download" tile will download an Excel Spreadsheet (.CSV File) This report will contain the following information. First Name: As provided by the registrant at time of registration. Last Name: As provided by the registrant at time of registration. Email Address: As provided by the registrant at time of registration. Address 1: As provided by the registrant at time of registration. Address 2: As provided by the registrant at time of registration. City: As provided by the registrant at time of registration. State: As provided by the registrant at time of registration. Zipcode: As provided by the registrant at time of registration. Phone: As provided by the registrant at time of registration. Mobile: As provided by the registrant at time of registration. Company Name: As provided by the registrant at time of registration. Title: As provided by the registrant at time of registration. Status: Indicates if the registration is cancelled, or approved. Purchased Quantity: The total number of registrations purchased, for example a single person could register for 4 seats in the concert hall or bus ride. Cancelled Quantity: The total number of registrations cancelled, for example a single person could register for 4 seats in the concert hall or bus ride, and cancel 2 of them. 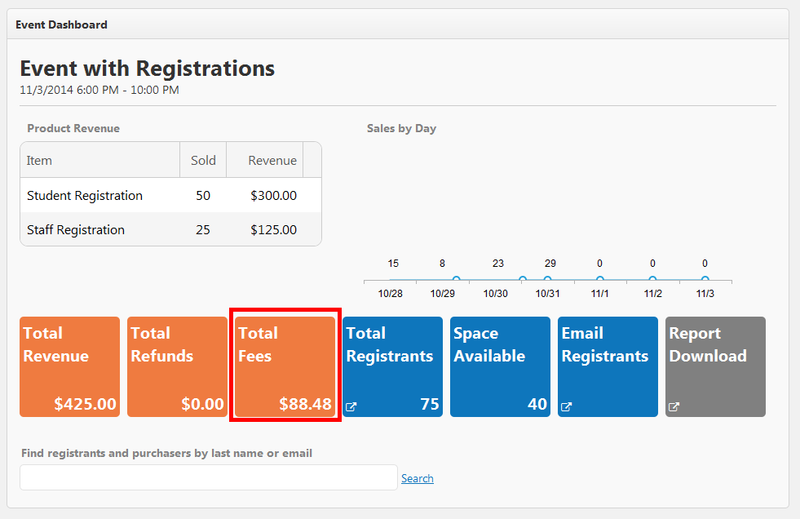 Purchased Total: The dollar amount of all registrations purchased for a single registrant. 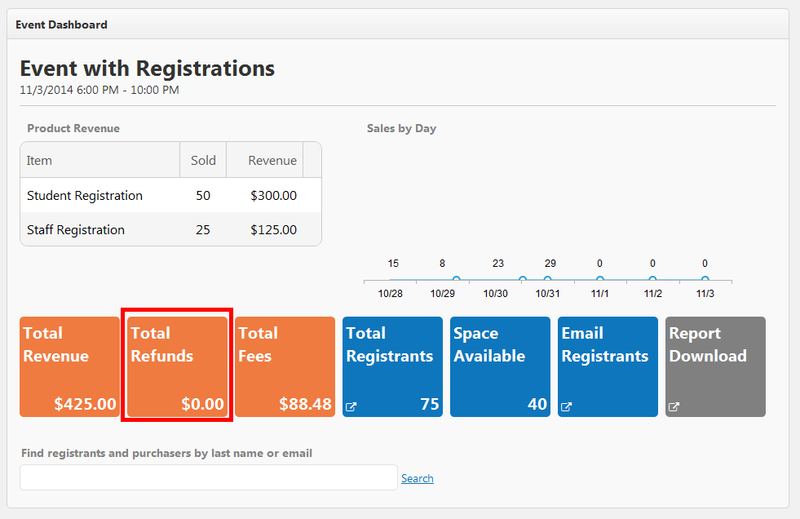 Cancelled Total: The dollar amount of all registrations cancelled for a single registrant. Purchase Timestamp: The date and time of the registration. Product Description: The description added to the item in the create an event screen. Additional Custom Fields collected at the time of registration. Event ID:The system generated unique Identity (GUID) for the event. Registrant ID:The system generate unique Identity (GUID) for the person who has registered for the event. 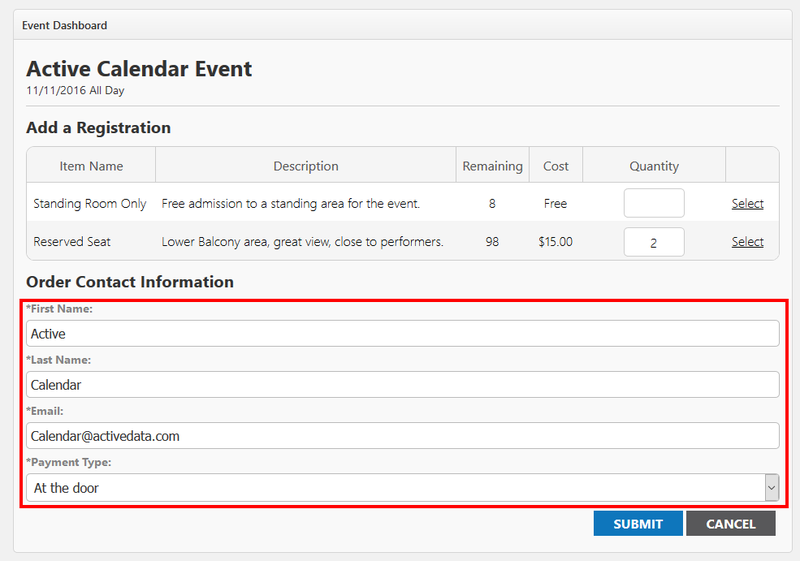 You can add a registrant to an event to allow for "back-end" processing of event registration. This feature can be used to provide complimentary registrations to guests, or to record payment for registrations that occur outside of Event Publisher's payment processing. From the Registrants Tile in the event dashboard, click the "Add a registration link"
The list of available registration types (Products) will be displayed. Indicate the quantity for each item that the registrant has requested. Provide the Order Contact information. This information is used to associate all of the purchased items to a single order. Provide the registration information for each item. Some registration items may be configured to collect custom informaiton. Once completed, the screen will display a message indicating that the the registration was succesffully added, and show the registration detail record. Each payment type has a unique purpose and use case. Some payment types incur a fee, others do not. All payment types modify the contents of the confirmation email received by the registrant. Complimentary: Use when the registration should not have any financial or monetary value associated to it. The calendar administrator is providing the registration at no cost. The confirmation email received by the registrant will show $0.00 for any items with a cost associated. At the door: Use when the registration still has an associated cost, and the payment is outstanding. All monies will be collected prior to entry to the event. The calendar administrator is still collecting funds for this registration. A Fee is assessed to the transaction. Collection of this fee will be invoiced monthly. The confirmation email received by the registrant will show the dollar amount (price) for any items with a cost associated. Over the phone: Use when the registration still has an associated cost, and the payment has been completed via an external process. You can issue refunds for items purchased from the Dashboard Page that contains all registration and sales information for that event. Please follow the instructions below to issue a refund. PLEASE NOTE- refunding does not include fees paid by the customer, they will be refunded the cost of the item only. Additionally, there will be a refund processing fee charged by PayPal against the account configured in payment gateway configuration. To begin the refunding process you will need to navigate to the Dashboard for the event that has an item that needs to be refunded. Once you have reached the dashboard page for that event, proceed to step 2. Search for the person to be refunded. At the bottom of the Dashboard page is a search box. Search for the person requesting the refund by either last name or email address. 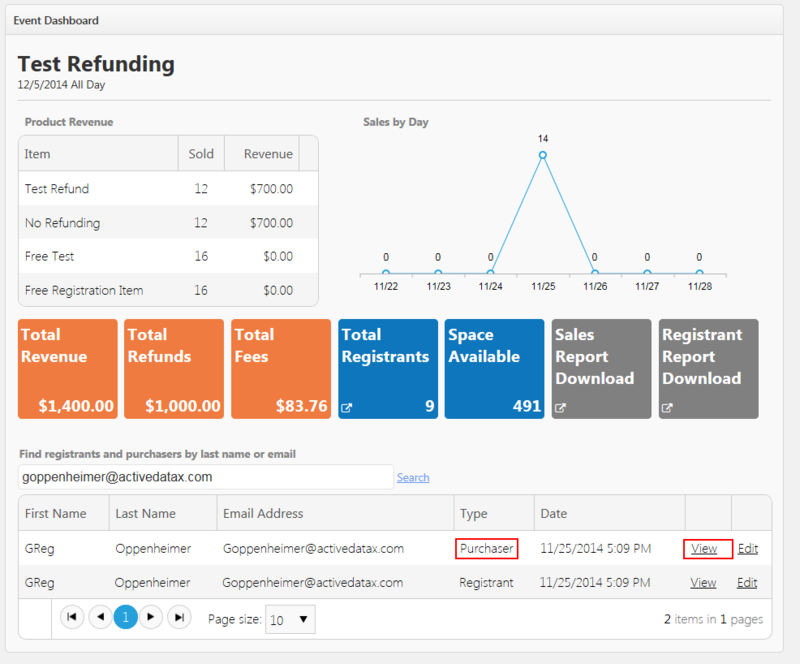 Once you have located the individual seeking a refunding, click the "View" link on the purchaser record. You will now see the details for the transaction, click the link, "Refund Transaction". 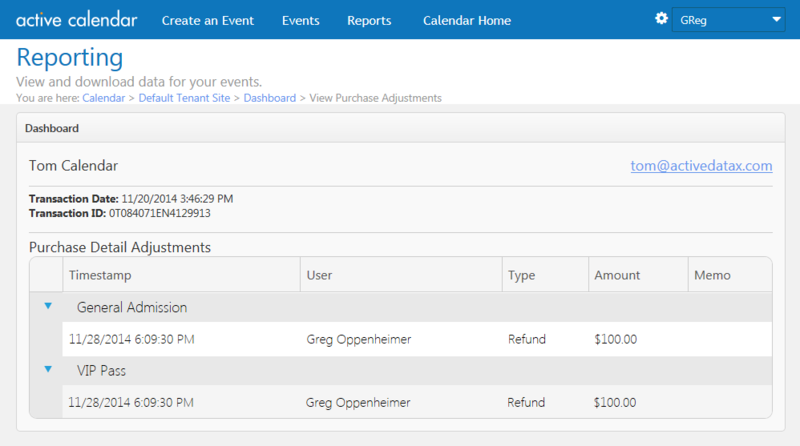 The refunding page allows you to specify the amount to be refunded, as well as add a memo available in reporting. Specify the amount to be refunded and click the "Refund" link. Confirm your refund by clicking, "Yes". Available from the dashboard, this page will display information related to the transaction, as well as links to "Refund Transactions" and "View Adjustments"
First Name, Last Name, and email address of the purchaser. Product Name: The name of the item that was purchased. Unit Cost: The cost of a single unit of the product. Quantity: The number of products purchased. Total Cost: The quantity multiplied by the unity cost, in dollars. Refunds: The dollar amount of all refunds for a particular item. Revenue: The total cost less refunds. Total Fee:The dollar amount of the fee paid by the customer for a particular product. Available via the View Purchase screen, the view adjustments screen will provide a history of refunds for a particular purchase. Timestamp: The Date and time that the refund was issued. User: The user who refunded the purchase. Type: A refund or an adjustment. Amount: The dollar amount of the refund or adjustment. Memo: The text added by the user issuing the refund at the time of the refund. The Registration Page displays a list of persons who registered for an event. This page will only include information for items added to events as "Registration" items. Items added to events as "Sale Items" are not included on this report. A list of registrants will be displayed on this page. Registration Date: Filter by Range of Dates of when a person registered for the event. Two fields are available, start date and end date. Attended: Filter by Attendance status. Filter the results to display only registrants who attended the event or by those who were absent. Please Note: By default all persons are given an attendance status of "Absent". To filter the results of registrants click the text "Search". You can track a persons attendance for your event using the registrant report. To change the attended status for a person simply click the checkbox located to the right of the Registered date and time. You can view the extended information for a person who has registered via the "Details" link. All responses provided (information collected) during registration will be visible on this screen. For example, if at the time of registration the person provided their phone number, or company name, it would be displayed on this page. To access the Registrant details page click the text, "Details". Event Information: This includes the Name of the Event, Start Date of the event, and Start and End Times for the event. First & Last Name: Of the person provided at the time of registration. Email Address: Of the person provided at the time of registration. Date and Time of Registration: The time of which the person completed the registration form or checkout process. Attended Checkbox: Indicates if the person attended or was absent from the event. Cost of Registration: The dollar amount of the registration, if there was no cost associated with the registration the text, "Free" will appear. Product Fields: The final columns of the report are based upon the values collected by product fields. Product Fields are sets of questions and answers that are configured in site settings. 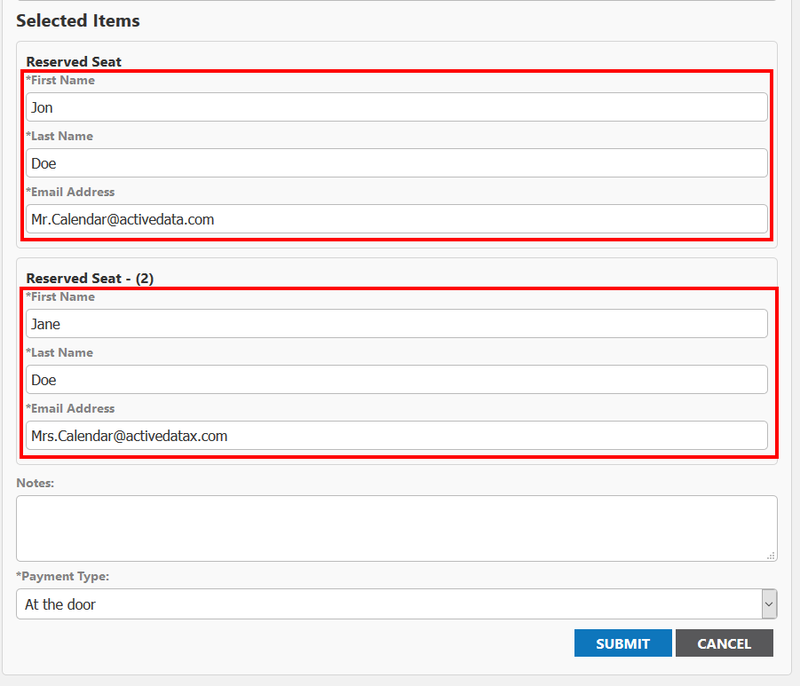 (click to navigate to the product fields page) The number of columns that are populated in the table are also dependent upon the number of enabled product fields. The Display name of the product field will populate in the first row of the column, and the value(s) provided by the attendee, will be populated below the first row of the column. Item Name: Such as RSVP, Guest, or VIP, this is the name of the product that the person registered for. Quantity: The number of items purchased in the order. Unit Cost: The cost of a single unit of the item purchased. Total Fees: The cost of all fees associated with the item purchased. Total Paid: The cost, calculated as unit cost multiplied by quantity, plus total fees. Payment Type: Details if the registration as paid online, processed over the phone, or if money is due at the door, or if the registration was complimentary. Registration Source: Details if the registration as added via the administrative area, by an external application leveraging the registrant API, or if the registrant processed the registration online. Additionally, links will be displayed on the detail view. View Purchase Information: Allows for you to view the details for the entire order, as well as process a refund if applicable and supported by your payment gateway. Cancel Registration: Allows the administrator to cancel the registration, and release the space available for another person to register. Edit: Allows the administrator to modify the information provided by the registrant. 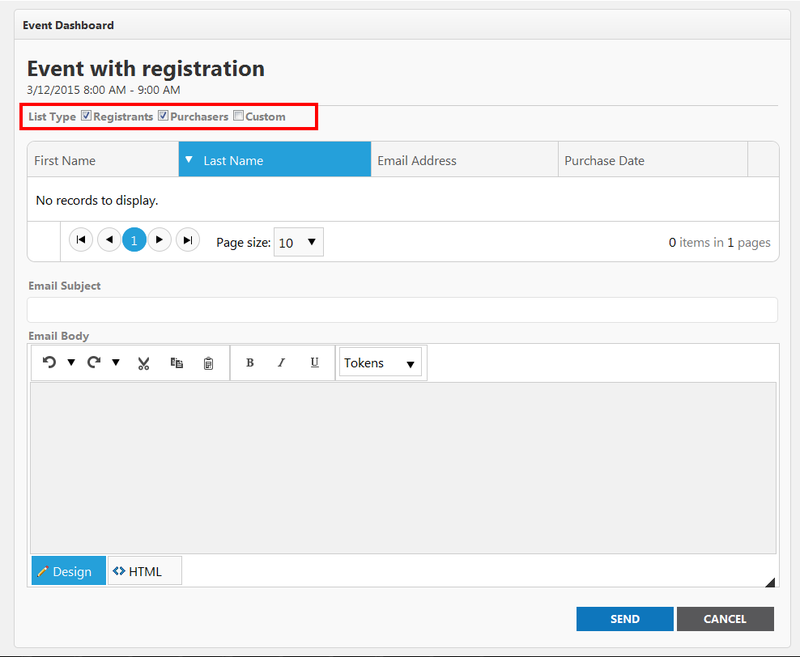 Print: Allows for you to print the details of the registration that is currently displayed. Using the edit details function you can modify the information provided by the registrant. You can edit the information that an attendee provides by clicking the Edit link to the right hand side of the Registrant Detail View. 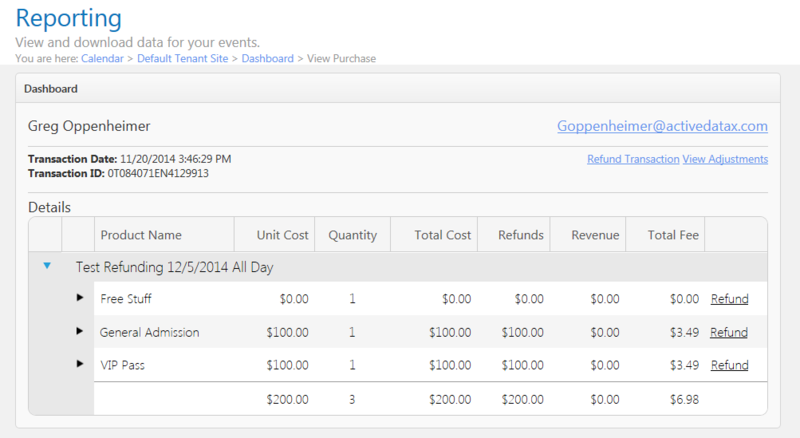 The Event Attendance Edit screen allows you to edit information provided at the time of registration or checkout. In this screen you can edit information that was collected by the particular item that the attendee registered for or purchased. It is important to note that you can only edit information collected, and not add additional fields of information. For example, if the only two fields collected for the item were first and last name, you would be able to edit the first and last name. Conversely, if you collected first and last name, email address, and a product field question (click to navigate to the product fields page),you would be able to edit all of those fields. Please note: The "Edit an Attendee" screen does not allow for you to cancel an attendee, or increase / decrease the quantity of the item associated to the attendee. To complete editing the attendee, click the text, "Save" to discard your changes, and return to the details view click the text "Cancel". After searching for purchases by last name, email address, or transaction ID the following table will be displayed. You can view the extended information for a person who has made a purchase or registered via the "View" link. All purchase or registration information will be visible on this screen. To access the purchase details page click the text, "View". Unit Cost:The cost of the Product or Registration that has been purchased or registered for. Total Cost:The total dollar amount (excluding fees) paid by the consumer, for the units purchased. Total Fee:The total dollar amount of fees collected by Active Data for the units purchased. Total:The total dollar amount (including Active Data fees) paid by the consumer, for the units purchased. Available to our Premium License Clients, the location conflict report will display all locations that are currently double booked. A site or location administrator selects the, "Publish Anyway" check-box on the Location Conflict panel in event publishing. A site is configured to "Allow Imported Events to Double book a location." and an event is imported that conflicts with an approved event. If an event has an item that allows for "waitlisting" you can access the waitlist for that item in multiple ways: the Revenue Statistics Report, Event Attendance Statistics Report, or via the Dashboard for an event. When persons have joined the waitlist for an item, a link labeled, "Wait-list" will appear at the far right of the row for that item. First Name is the first name of the person on the waitlist for this item. Last Name is the last name of the person on the waitlist for this item. Email is the contact email of the person on the waitlist for this item. Phone is the contact phone of the person on the waitlist for this item. Join Date is the date and time that the person joined the waitlist for this item. 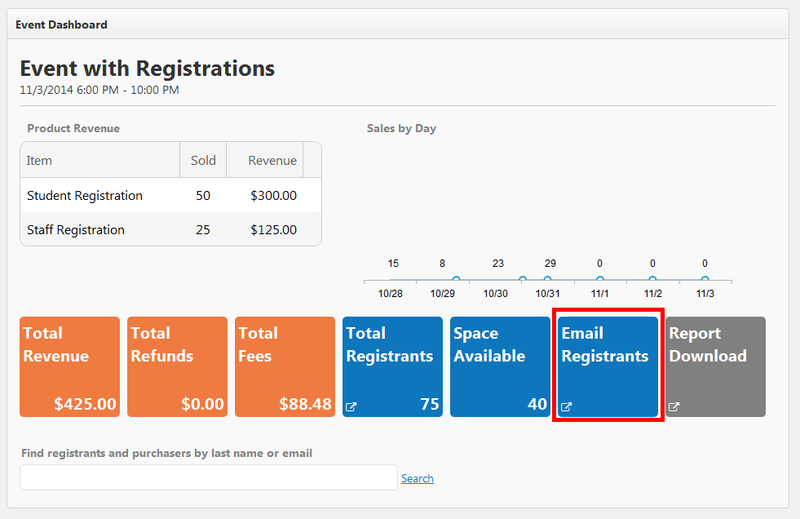 Actions a dropdown field which allows you to either edit the "waitlistee" or add them to the list of registrants. When Selected, you have the ability to view and all information provided by the "waitlistee". The following additional fields are displayed. Internal Comments This text area allows for you to enter notes about the person on the waitlist. Internal Status This dropdown allows for you to manual track the status of the person on the waitlist. Please note: the default internal status for a person on the waitlist is "Not Contacted". When selected you will be directed to the administratve registration page, with the first name, last name, and email address of the "waitlistee" prepopulated. Full details on registering the "waitlistee" are available here" How to add a registrant as an administrator.